When I draw a rectangle on the desktop using the left mouse button (using a tracking pad on a laptop) nothing happens. No menu opens and therefore there is no option to create a new fence. The only reference to Fences that I see in this menu is "Lock Fences" and I have tried both with this setting on and off. Thank you Basj for your help. I am writing here as the forum rules wouldn't allow me (as a newbie) to make another post. Before following the advice in the last post I had a look in the folder where the program was installed (In my case, C:\Program Files (x86)\Stardock\Fences), and I ran the executable program "SasSteam.exe". I don't know whether this is actually what fixed the problem or not, or how it would help at all, but I noticed immediately afterward that I now have the ability to create Fences. I am posting this in case it helps others, and also to acknowledge the help given by Basj. Apologies, It seems that the picture hasn't shown up properly. It was of the menu that shows, "View", "Sort by", "Refresh", etc. 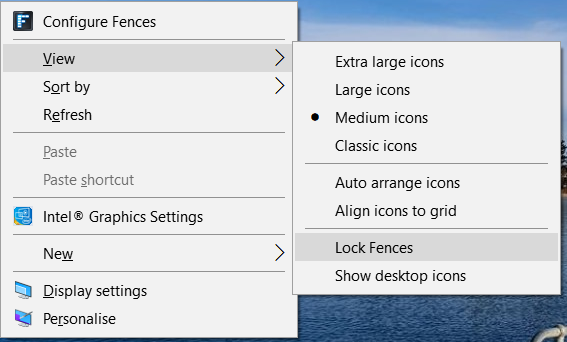 To repeat my final comment from the previous post, the only reference to Fences that I see in this menu is "Lock Fences" and I have tried both with this setting on and off. Make sure to re-download latest Fences from your account to ensure fresh file. And reboot the system after the re-installation. Test and report back here. I have followed the instructions from the page which you linked. Unfortunately this has not helped. If it helps, I have used Steam to get the software. I recently got it as part of a Humble Bundle. Everything else seems to be working fine for me. Is there any alternative way to create a folder other than dragging a rectangle?